That pretty much sums up my experience last night at Fatty’s Cafe and Crescent and Vine on Ditmars and Crescent. I had such a great time and was crafting my blog post in my head last night as I was falling asleep, knowing full well I wouldn’t remember a word of it when I woke up. But upon waking up, I’ve since decided a better title for this post would be “Holy Sh*t, My Life is Awesome”. Why, you ask?? Da dada DAAAAA!!! Here is the exciting news I had mentioned earlier in the week. On Tuesday I was contacted by Jeanmarie Evelly, reporter for DNAinfo.com. She had heard about my project through the magic of the interwebs and wanted to get together to talk about it, take some cookies pictures, and write an article. I, of course, was thrilled and squealed YES!, all the while leaping around my apartment. The natural, organic process by which this came about says to me that yes, this one, small thing can do real good and maybe if more people know about it, more good will happen. So, thanks to Jeamarie for being the first one to get it out there and crafting such a well written article and story. Now back to last night. In a word: warm, inviting, friendly, honest and real. Oh, I’m sorry, was that more than one word? Well, I can’t fit all the awesome of Fatty’s Cafe into just one word, so sue me. As I walked in, I was surprised by a familiar face of Rodrigo, who I’ve gotten to know a little bit while he was working at TQK. Funny thing is, I saw him just this weekend at The Strand and said, Hey! It’s you!, not knowing I’d also run into him just days later in a completely unrelated manner and venue. Reason #5697 why I love Astoria. So after I said hi to him and explained the real reason why I was there, I sat down to have a bite to eat and enjoy the gently falling snow outside. Also working there last night was Morgan, great girl who I hope makes her Jamaica plans soon. And why do I know about those? Cause that’s just the way Fatty’s rolls. Customers are people, not just dollar signs, as further supported by my conversations with the owner, Fernando, later on that evening over wine next door. I had the chicken pressed sandwich and a side of grilled asparagus, which is off the chain. Not a phrase I say often, but seems appropriate at this moment. I had finished up and a gentleman named Joe came in,we got to chatting and apparently he is a regular there. Nice guy, does sketch comedy, outgoing personality, the whole bit. Morgan gave him one of my cookies and he asked me what kind of chocolate I used. 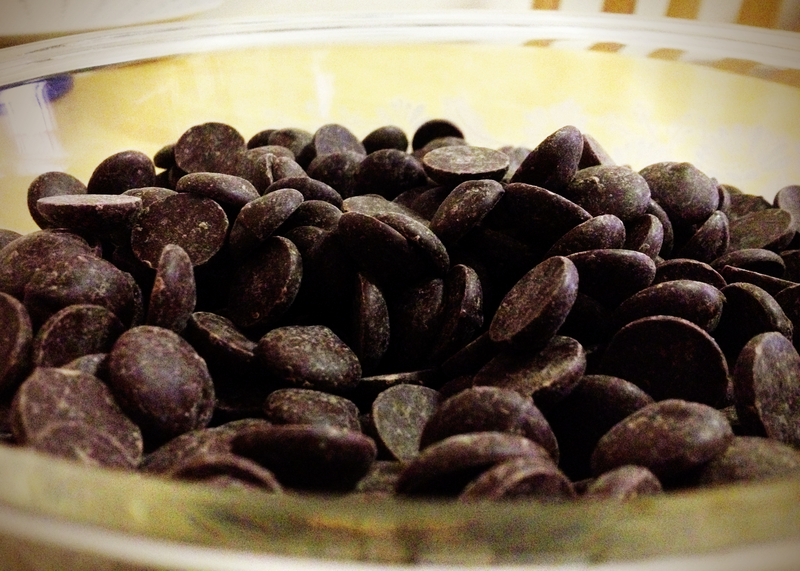 I use plain old chocolate chips, usually store brand or Nestle. He then said, “I work for Ghiradelli and have some sample chocolate in the car, hang on, I’ll go get some if you want.” IF I want?? Oh brother, I always want good chocolate. Which is how I ended up with these beauties. 60% Dark chocolate baking chips. So a huge thank you to Joe and I’ve got enough chips for a few batches! I popped in next door to say hi to Fernando and introduce myself when I was finished with my meal at Fatty’s. I thought I’d just pop in and be in my way in 3 minutes, then maybe make my way up to Singlecut while I was in the neighborhood. How would I know I’d be sharing bottles of wine with these guys (Fernando, Dan the bartender, and their friend Matt) and leaving at 12:30?? We talked about personal philosophies, business philosophies, backgrounds, life, stories were shared, and friends were made. I found out that Fernando’s view on business was different than some other business owners I’ve encountered. They’re not out to try and be “cool” or to make millions, or to dominate a market. He just wants to contribute something back to the neighborhood, and that is reflected in every aspect of his businesses. He said to me, “You didn’t have to bring us cookies to be our friend, for us to be sitting here, sharing wine and company, we do that anyway”, to which I replied, “But that’s exactly what makes me want to bring cookies and good will here, and why you deserve it”. They are both definitely places I will go again and will look forward to going. For those of you in NYC, be careful amidst the snow out there but don’t let it get you down. I challenge everyone to find 3 positive things in their ‘everyday’ today. I guarantee a brighter, happier day if you do that, and maybe you might just be the positive thing for someone else.